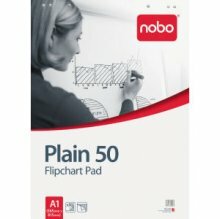 Contains 50 perforated full white, non-bleed sheets in large A1 size for easels. Holes punched to fit standard easels. Both premium and economy paper will not allow marker bleeding. Premium is ideal for those quality presentations that need to make an impact. Housed in protective polybag for easy storage.